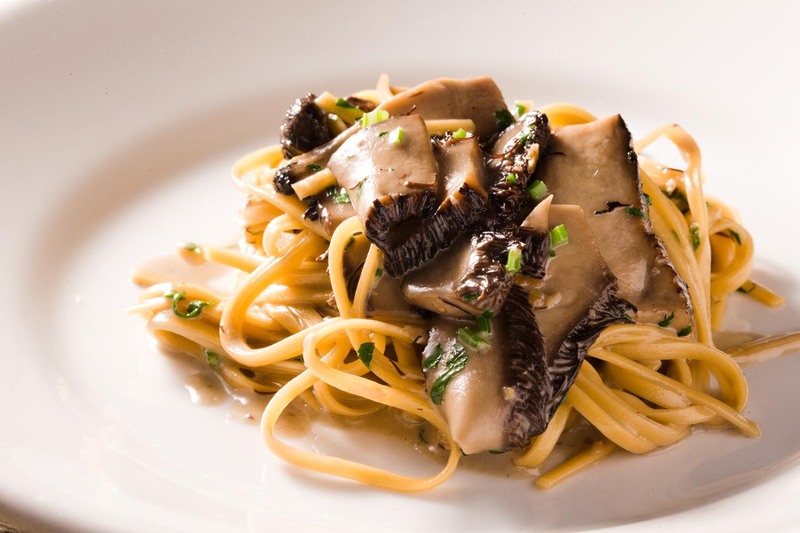 Italian cuisine with Japanese sensibility, Cignale Enoteca is a hidden treasure. Meander through the small streets on the outskirts of Shibuya and step into this local neighbourhood eatery. It is refined but incredibly approachable and the delicious food and genuine service will probably have you wishing that you were a local. The Vespa parked out front is a good sign that you are on the right track. Large glass windows offer a glimpse into the warmly lit interior. Open the heavy wooden door into the cozy, rustic ambience of a country home kitchen. The chef’s personal taste is reflected all around. He doesn’t like waste and prefers vintage and antique items like vintage American wood counters and textured tall wooden chairs. Traditional Japanese stucco walls offer a calming backdrop to some eclectic decorations and hold simple blackboards listing the delicacies on offer each day. It almost feels like you are in someone’s home with the open kitchen and semi-private room flanked by shelves of books, candlesticks and other knickknacks. When you sneak upstairs for the restroom you get a peek into the wine cellar and the space where bread and pasta dough is kneaded fresh each day. Sitting at the twelve-seat counter, a tray of cypress sprigs topped with fresh greens, blueberries, onions and limes is right in view. As the evening unfolds, you get to appreciate the chef’s special talent for making these ingredients speak for themselves and feel the warmth and love he pours into every dish. Chemistry of "Italian x Japanese"
When asked about his cooking style, Chef Tomori uses an analogy from his earlier days as a photographer: he puts an Italian filter on delicious ingredients to create his own unique cuisine. 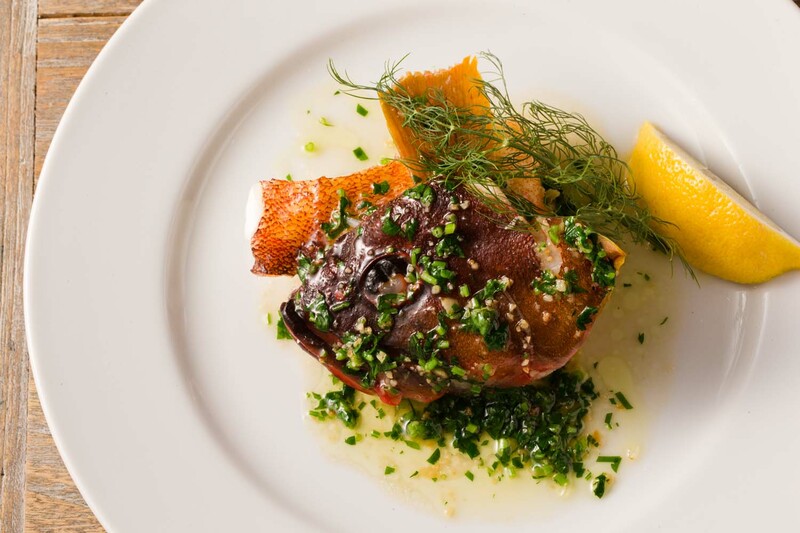 The seasonal prix-fixe course offering choices within is filled with flavor, a squeeze of citrus or a dash of vinegar, lots of vegetables, and beautiful colors. 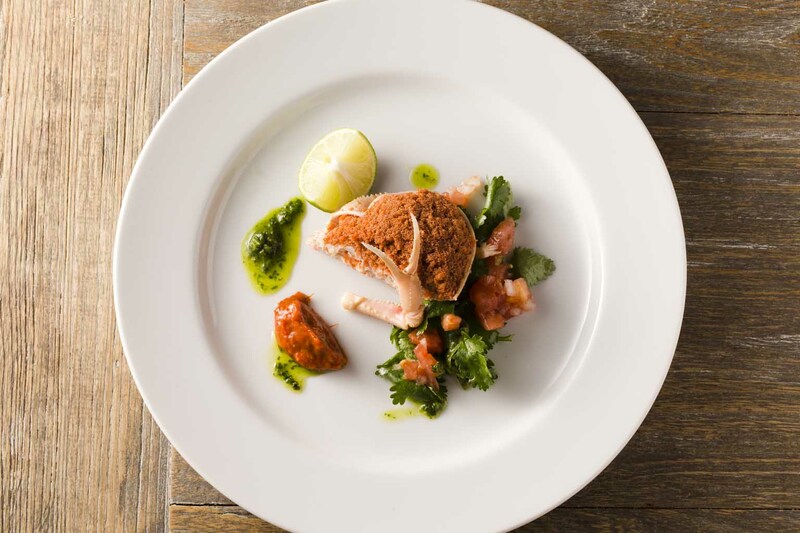 The simple yet appetizing plates offer contrasting tones of pinks and greens, appealing to both the eyes and the taste buds. And they can all be enjoyed with either fine-tipped chopsticks or dessert-sized knives and forks. The very first dish is the perfect example of this idea of Italian cuisine with Japanese sensibility. 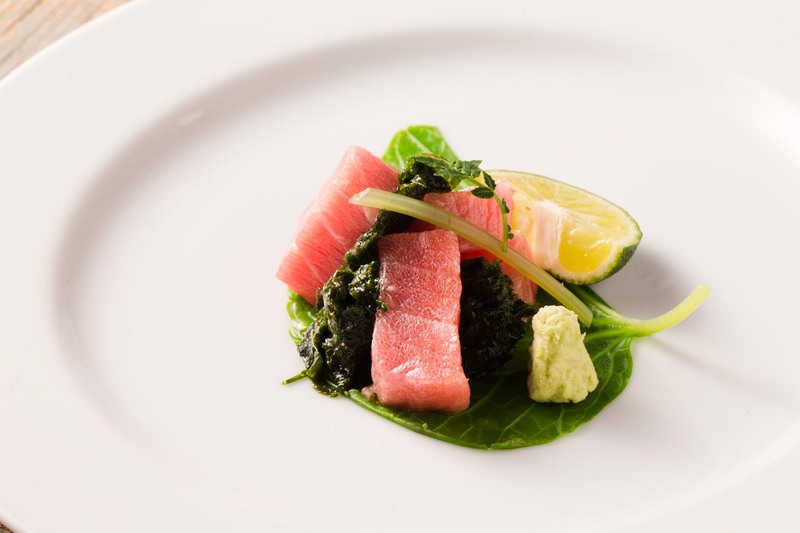 While a traditional meal may start with carpaccio, Tomori presents chutoro sashimi atop a wasabi leaf with anonori green laver in a red wine vinegar marinade. Dining in autumn, next may be the salty and zingy flavors of seikogani snow crab. The plump meat is topped with hundreds of tiny eggs that pop in your mouth, enjoyed with homemade harissa, key lime and coriander. 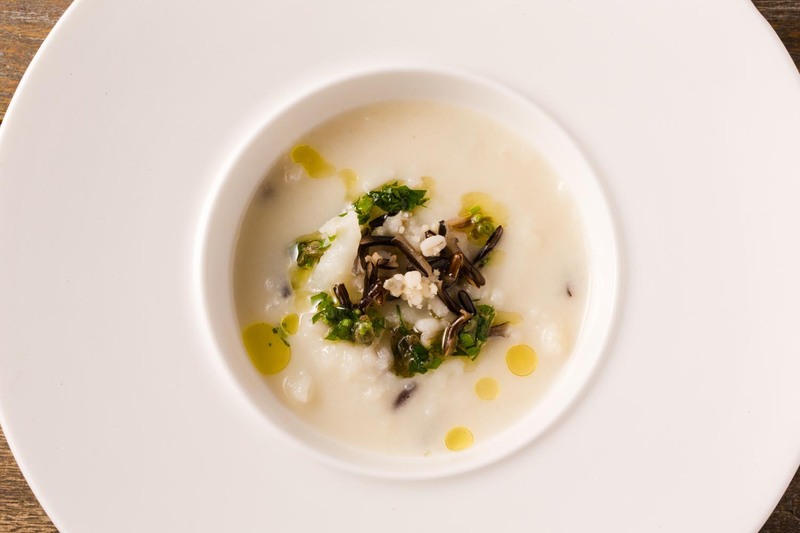 A cauliflower minestrone with wild rice and herb oil is seriously elevated comfort food, followed by succulent steamed blacktip grouper (akahata). 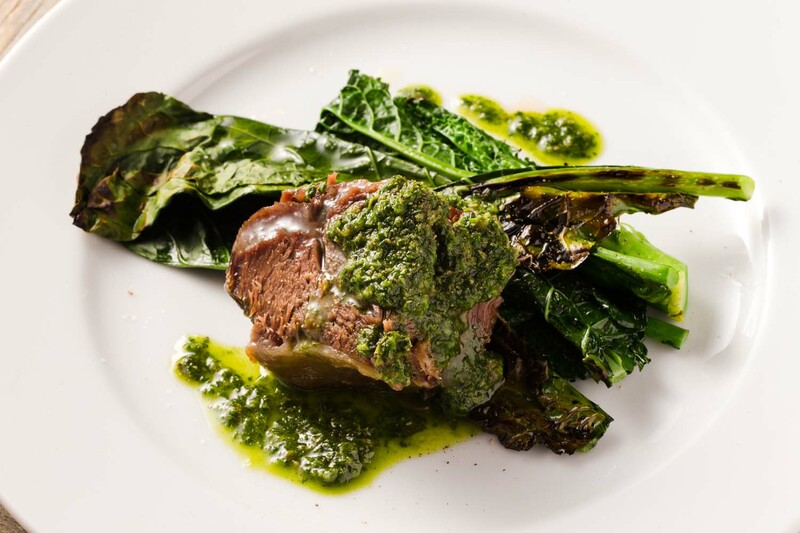 Beef cheeks that absolutely fall apart at the slightest touch of a chopstick are served with salsa verde and sautéed Italian greens that give the perfect crispy and crunchy textures you want. This is warming homemade food without any heaviness. When you think it couldn’t get any better than this, the pasta course arrives. 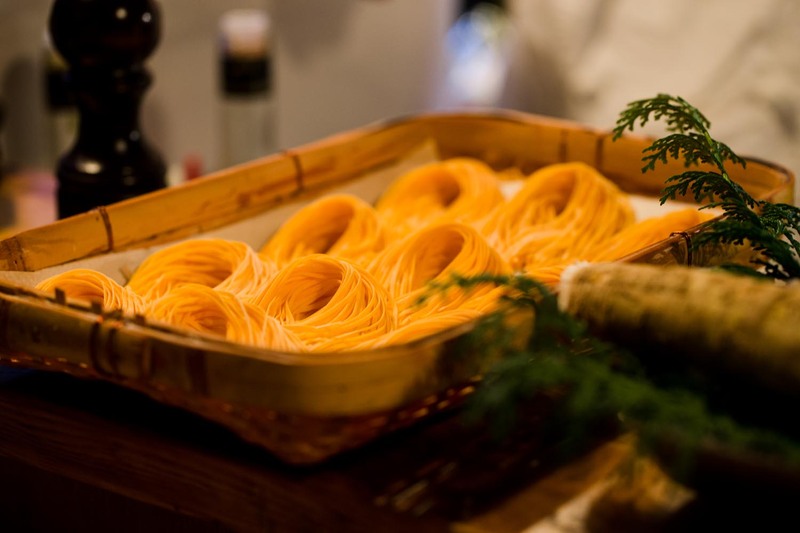 Tajarin, an egg-yolk-rich pasta from Piemonte, is handmade upstairs everyday into thin ribbon strands. Traditional Italian fish sauce adds depth and umami to the creamy mushroom sauce and every mouthful is rich al dente deliciousness. 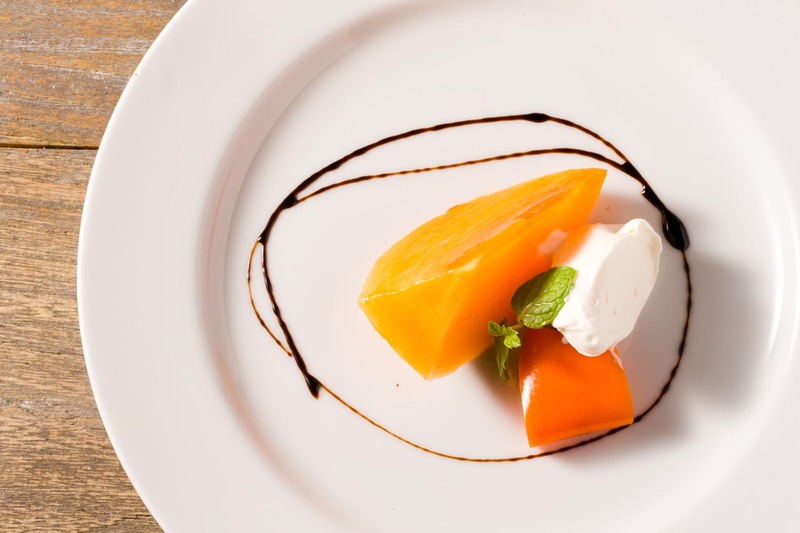 And because the chef feels that your senses are ready to rest now, dessert almost always features fresh seasonal fruits. November means persimmons, ripened almost to jelly, with a sweet balsamic sauce and amaretto-infused hand-whipped cream. Tomori uses different specialized suppliers for each of his proteins from crab to white fish to tuna and beef. He calls ports directly to try and obtain seasonal oysters from Hiroshima to Saga, always ensuring he gets the tastier smaller-sized ones. And he has personal contact with hunters to supply delicious duck. For vegetables, he loves strolling through the Aoyama Farmers Market on weekends and visits Tsukiji three or four times a week. 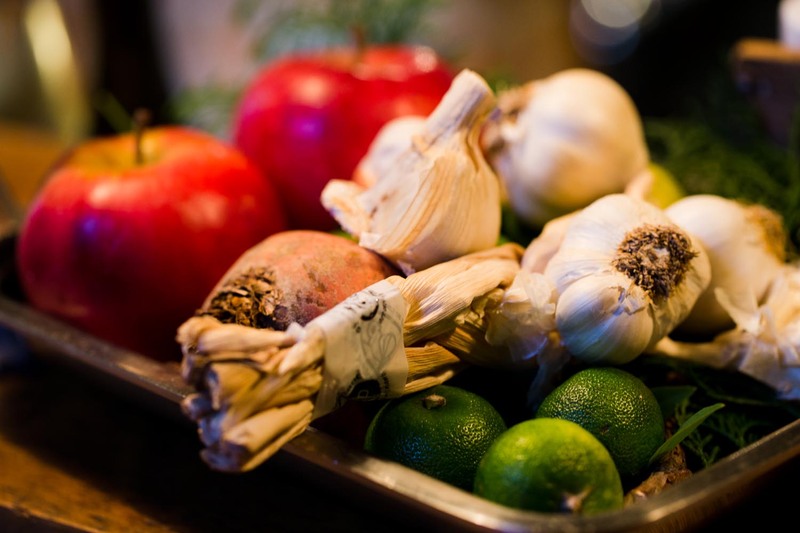 While his focus is on homegrown ingredients, Tomori occasionally looks overseas for premium produce, especially for items not readily available or not yet up to par with his expectations, like artichokes. But Tomori hopes to change that by establishing tie-ups with Japanese farmers to create excellent quality produce. Toshiji Tomori is lovely and warm and it is a pleasure to sit and chat with him as he cooks. There is something so comforting about his style and food that you want to cuddle him at the end of the evening. So how did he get to where he is? Raised in Tokyo, his father was a public servant who to this day still checks in to make sure Tomori is paying his pension. As so often happens with the second child, he was a free spirit and left university early to try other things. Starting in hospitality at age 18, first at a bar and then an Italian restaurant, the latter experience prompted him to attend culinary school in Piemonte, Italy at the age of 26. Tomori spent the next five years in Italy honing his skills. 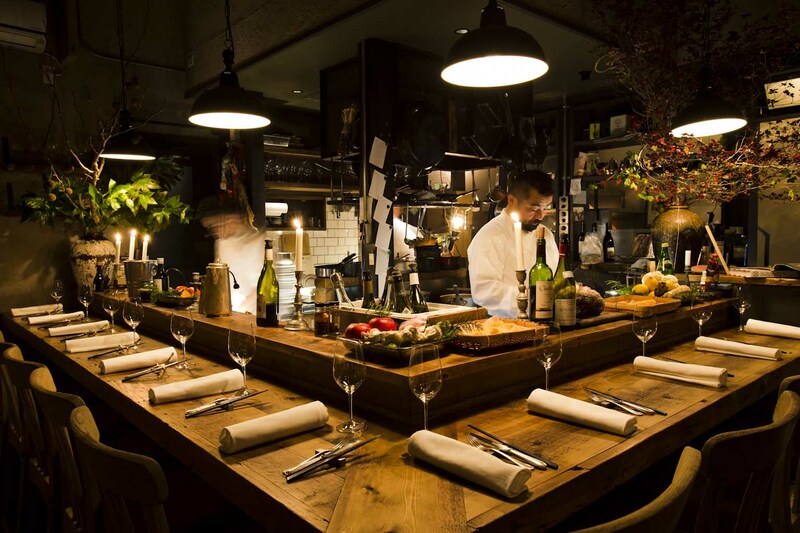 He immersed himself in the language and developed a wonderful rapport with his mentors, working under the famous mama at Guido and a Michelin-starred chef at Arnolfo. The talented and sometimes scary mama at Guido imparted so much of her knowledge to Tomori on traditional Italian, and in particular Tuscan cuisine. He was expected to learn every aspect of the restaurant from cleaning to making pasta and desserts. The stress of mishaps and communication problems compelled him to study harder, working all day and night and studying into the early hours of the morning. This is his base – these are the flavors and ideas that he keeps coming back to. Arnolfo, in contrast, was modern, creative and focused on beautiful plating. Tomori was immediately assigned to the sweets division – a tall order at a restaurant that serves a pre-dessert, dessert, and petit-fours and offers 16 types of homemade gelato every day. After working at a number of restaurants around Tokyo upon his return, Tomori took a totally different turn. He built a career as a food photographer for seven years, maintaining his cooking skills by catering for private clients in his spare time. Faced with the major milestone of turning 40, Tomori realized he wanted to open his own restaurant. 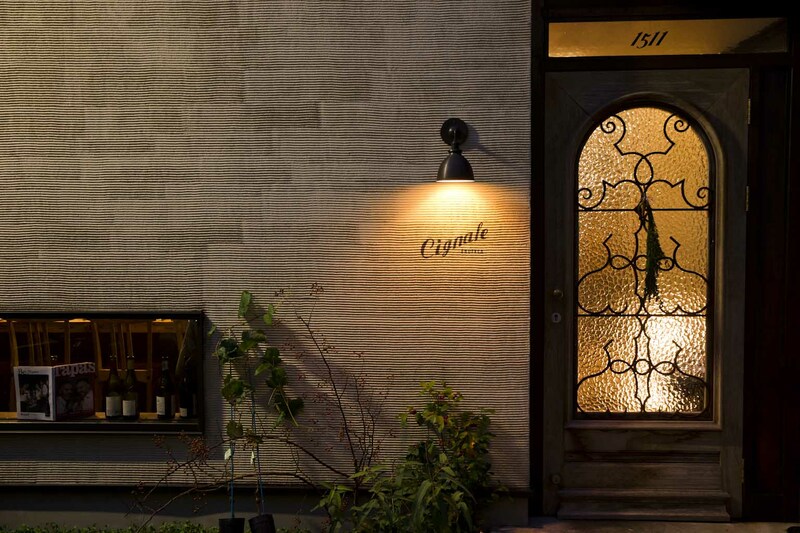 That was the beginning of Cignale Enoteca – six seats in the Tokyo suburbs. An endeavor so successful it rapidly outgrew its roots, prompting the move to the current larger location – much to the joy of regulars and newcomers alike. Tomori is feeling really settled in his new space and wants his staff to feel that way too. He says there are so many things he wants to try that he has to suppress the urge to do them all. It will be exciting to see what he does pursue in the future. If the present is any indication, it is bound to be delicious. Chef Tomori enjoys a glass of wine and has gathered an extensive collection for guests to enjoy. It rests behind an antique door with gold letters spelling ‘Vino’ - one of Tomori’s favorite antique pieces. 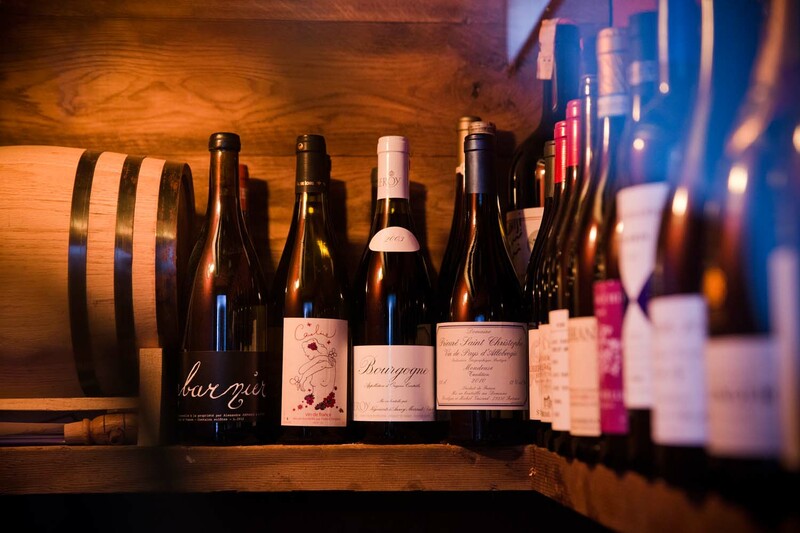 Featuring wines from around the world, there is a heavy emphasis on France, especially Bourgogne reds which complement his lighter style food without overwhelming it. 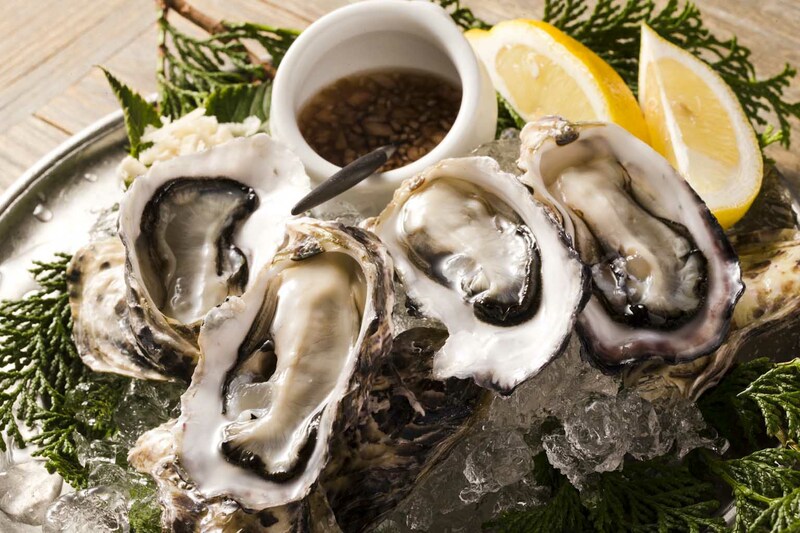 Refreshing acidity, an almost salty flavor, with a sherry-like aroma – these are some of the many interesting whites that might accompany your seafood courses. 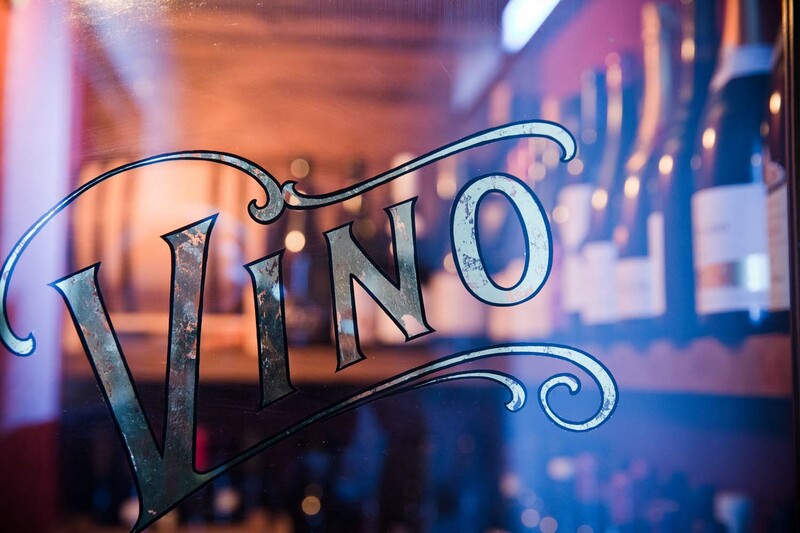 Aware of the possibilities for organic and natural wines, a new sommelier with specialist knowledge in this area has joined the team to help you make the perfect selection. To enjoy the full range of flavors and really appreciate the chef’s philosophy, the best choice would be the wine degustation.